By now you’ve heard the good news that Aquaman‘s Jason Momoa is coming to the first ever Comic Con Africa. Of course, he is only the first headline guests confirmed by the event’s organisers, ReedPOP, Reed Exhibitions and VS Gaming. Yes, there will be many more big names to rub shoulders with come the 15th and 16th of September 2018. Nerds, geeks, fanboys and fangirls pay attention! Here is your chance to win a weekend pass to one of the year’s biggest comic book events. Comic Con Africa is to be held at the Kyalami International Convention Centre in South Africa between September 14-16 2018. While it won’t be the first convention of its kind in South Africa, it is the first time it’s ever been done on this scale. For the first time, it is truly an international event. This is all thanks to ReedPOP, who have a history of hosting Comic Cons worldwide. There will be geek merchandise, toys, gaming, cosplayers, props, and exciting panels taking place. It really is a geek’s dream come true. You can find out more about Comic Con Africa on their website: www.comicconafrica.co.za. General admission will cost R150 per day – with three day passes already sold out. To stand a chance of winning a weekend pass to Comic Con Africa, all you need to do is tell us why you’d like to go and what you’d like to see at the event (in the comments section below). Please use a working email address. Competition closes Wednesday, 29th August 2018. I would literally love to see EVERYTHING!! It has been a seriously wish of mine to be able to attend Comic-Con in America but alas :(. But now with it coming to South Africa, it makes the goal a little bit more attainable!. Though I have to add seeing Jason Momoa would be like the best :) Also wouldn’t mind seeing the cast of Game of Thrones and all the cool cosplayers. I want to go for the merchandise, cosplay and of course Jason Momoa. Can’t wait to share the experience with my husband. I missed FanCon and Free Comic Book Day and this would make up for that!!! Will be going for celebs, comics, games and panels…. I reaaaaalllly wanna go to Comic Con! JASON FREAKING MOMOA is going to be there! Freaking hell! The comic books would be epic! And the atmosphere and people are gonna be on fire! This would be incredible. To experience and see all the local talent and see how everything else that this event has to offer. I want to go to Comic Con because that will be the event of the year. If you don’t go there then you’re a loser and nobody wants to be a loser. I want to see all the incredible cosplays that people never bring to Rage and Geekfest. I want to see Khal Drogo *insert drool face* and all the international stars that will be there. This will be the biggest nerd/geek/weirdo gathering in Africa and missing it would be heartbreaking. I want to attend the panels so I can ask questions regarding shows and movies that have been eating at me for years. Also I will probably be buying out the whole place because of the awesome merchandises that will be there. I’m looking forward to meeting Jason Momoa while wearing my Khal Drogo cosplay. Need a photo! I would love to go to see the cosplay (and highly likely particepate myself) as well as being a massive fan of commics. I want to see everything and I want to be seen dressed as Iron Man!! M’aiq wants to go cuz he travels everywhere. I want to see ALL the things!! But my real interest would be all the cosplay entrants, any cosplay workshops/panels. Also any tabletop exhibits/gamesplays would be my next best thing. I would love to go as I wanna treat my son to comic con. Plus I wanna sit in Sheldon’s spot. This is the adult equivalent of a kid in a candy store… especially if it’s one owned by Willy Wonka. I really want to go because I love comics, grew up reading comic books. Being a mom raising a new generation superhero geeks and this would be a dream come true! Love all things Marvel and would love to see one of the Avengers- Thor maybe! 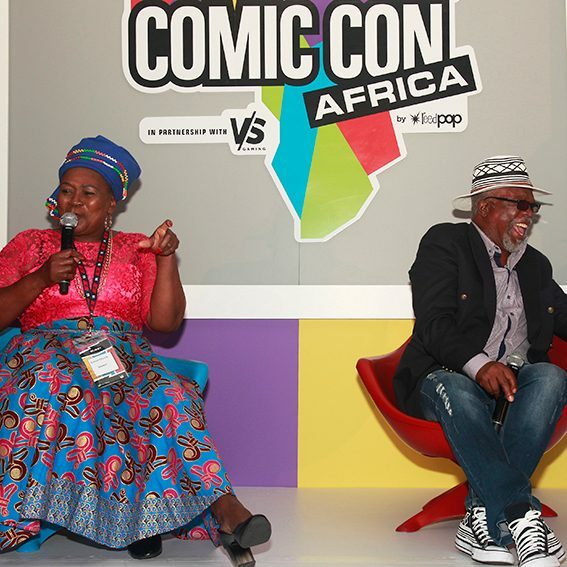 but the first ever true Comic Con on African soil …. I’d like to see all the cosplay and geek culture in South Africa!! I was a shy child growing up before the time of social media and cell phones. My escape was the world of comic books. I grew up reading Marvel and DC comics and also watching old SCI FI movies where I was taken to galaxies and universes far away from real life. Reading the superheroes overcome their villains helped me become a more confident person. Comic Con is the greatest celebration of the stories I grew up reading and would love the opportunity to attend this event. Not because comic books heroes are all the rage now, but because they were my fortress of solitude growing up. I would like to go especially for the cosplay. And i would love to go see jason mamoa as auqa man. I had been planning a trip to San Diego since 2006 specifically to go to comic Con. Obviously budget reasons have always hindered me. Life is hard. But hell’s bells we have finally got something on our shores that can compete and I would love the opportunity to go. Everything will be amazing at this event and I have to go!!! I want to go Cosplay with all of my friends at the event and would love to take pictures with all the guests. I would love to see some of the Avengers cast at ComicCon, international cosplay guests and local guests (such as Baka Sakura Cosplay or KomboKatjie Online or Black Lily Cosplay). We are planning a DC Bombshells cosplay group inspired by Ant Lucia’s artwork, so to have Ant Lucia himself as a guest would be beyond amazing! I’d like to go seeing as I can’t afford to go overseas to enjoy the international ones. Really love the culture of comics, games & nerdery. I’m a Cosplayer and would to experience a con of this magnitude. Also I would love to meet Aquaman! This would be a dream come true! The idea of being at the first south African comic con is hugely exciting. It’s a landmark and as a huge fan of comics and avid collector for 40 years, the opportunity to be among the first visitors to this event, would be amazing. We (hubby and i) of going to the United States for Comic Con but they isn’t going to happen for a long time. We are already trying to see where we can cut back in order to go to Comic Con Africa because it really is my husband’s dream. He is such a geek and so am I by association. We love seeing everyone in their Cosplay outfits, the imaginative and successful gender bends, the way they stay in character. If we won tickets, it would be a dream come true. Nick Allum – enter the competition! As a comic book for many many years this is going to be one of the most amazing experiences ever. Yes we had smaller events but this is going to be on a different level. I’ve been a fan of everything Superhero related since i was a little kid. I grew up with DC Comics and been a huge fan of their characters especially Superman . Being around fellow geeks and fans is just super awesome. I’m looking forward to all the merchandise, games, cosplay and ofcourse the celebs that are most likely to grace our shores including some big names in SA. That weekend the venue is going to be a Fortress of Solitude for many many like minded people and i hope i can be one of them for the entire weekend. I’m from Cape Town, would love to see any of the cast from Critical Role…. I’m a huge fan for DnD and tabletop gaming, play any games be it consol, pc or handheld, have been reading and collecting comics for years and actively participating in cosplay and the betterment of the geek community in South Africa. I love the cosplay and geek culture. Also I would love too see the celebrities!